Medline's Aloetouch® MicroThin surgical gloves provide extra tactile sensitivity. The Aloetouch MicroThin gloves are 20% thinner in the fingertip than standard gloves to provide extra tactile sensitivity. 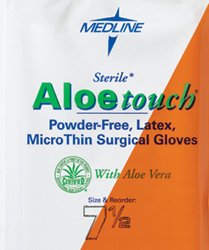 The Aloetouch MicroThin surgical gloves have an inner-coating polymer with aloe vera to help soothe and moisturize dry, irritated hands.